Despite the long holiday for Songkran, Thai New Year (13-17 April 2017), Thai Catholics plan to celebrate Easter as best they can. New Year celebrations are a great opportunity for Thais to return to their home towns and spend time with family. For Thai Catholics, it is a time to celebrate Holy Week. Fasting on Good Friday, which falls on the first day of the New Year, is an example of how their experience of the festive season is different from their fellow citizens. 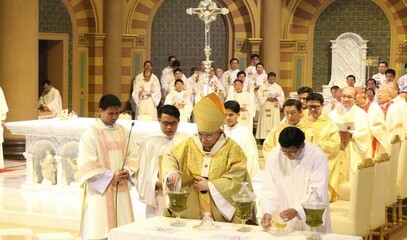 On Holy Thursday morning, Card Kriengsak kovitvanit, archbishop of Bangkok, celebrated the Chrism Mass with hundreds of priests and religious in Bangkok Cathedral. One of the concelebrants was Archbishop Paul Tschang In-Nam, apostolic nuncio to Thailand and Cambodia as well as apostolic delegate to Myanmar and Laos. After the Mass, Card Kovithavanij invited the faithful to congratulate priests who celebrated the silver and golden jubilee of their priestly ordination. During the Lord's Supper Mass in the Jesuit church of Xavier Hall, Fr Kriengyot Piyawanno delivered a brief homily explaining the significance of Easter celebrations. "Jesus washing the feet of his disciples is an exhortation for us to do the same and serve others," he said. After the homily, he performed the rite of the washing of the feet of 12 lay people. In many of Thailand’s Catholic parishes, like Holy Child Jesus in the Archdiocese of Bangkok, clergymen followed Pope Francis’s example and washed the feet of women, children and the sick. Thailand’s Catholics number 380,374, or 0.56 per cent of a population of 67 million. The Diocese of Chaing Mai, which is home to many ethnic groups, has experienced the fastest growth in recent years.